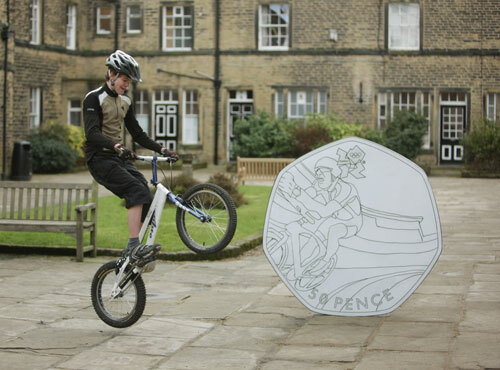 A Halifax schoolboy cyclist has beaten 3,000 other entries to win a Royal Mint design competition to create a cycling themed 50 Pence coin in celebration of the London 2012 Olympic and Paralympic Games. Theo Crutchley-Mack, 16, took part in a nationwide secondary school competition organised by the Royal Mint. His winning design was announced this morning, at his school, Rishworth, who won the £10,000 first prize. The design features a track rider at speed in a velodrome. He is the first teenager to have designed a circulating British coin. Theo’s design is the second in a series of 29 officially licensed London 2012 50 Pence commemorative coins, all designed by the public and depicting different Olympic and Paralympic sports. Pedal Sport Cycling Club grew out of the shop of that name owned by former cyclo-cross rider Mark Rusby, 37, a British Cycling Level 2 coach. The club is four years old and British Cycling Go-Ride accredited and has 40 under-16 and 70 senior members. Rushby said: “We’re absolutely thrilled by the news. Theo is a strong, skilled and enthusiastic cyclist – he even started assisting the coaches who take the younger classes. Theo’s cycling coin design will appear on millions of coins due to go into circulation from September.